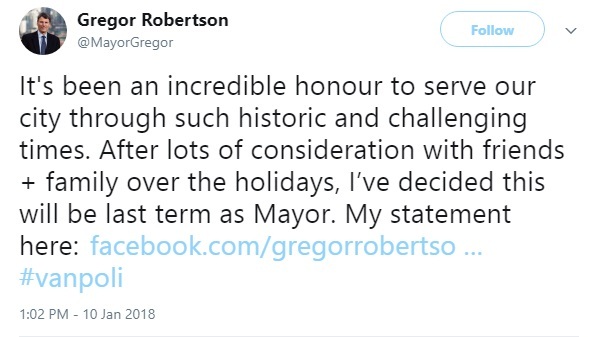 Gregor Robertson has announced he will not be running for Vancouver mayor next term. Thank God. That guy was losing touch with reality. Especially on Translink and the Mayors glutton council. Let's hope Kirk LaPointe will step up to the plate. That would give the city hope. Yup, a prime example of where these control freak types would take us if they could. The problem for Canadians is, you guys are usually just so damned polite these types get a lot further up there than they would down here. Both documents are available to read at the UNITED NATIONS website. Everything he did is directly from these documents. Mayor Moonbeam most likely is not running this time because of the changes to the municipal elections game rules regarding financing. Last time he ran, his campaign had to spend a lot of money to help him win what we don't really know is how much money was used and who it belonged to. 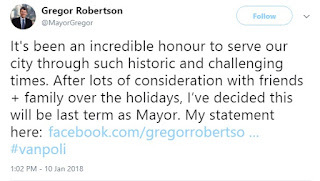 Robertson isn't that popular at this time so it is better to withdraw from politics than to loose. as to the "goals" he set regarding gas, cars, etc. some were good goals, it is just they lacked commons sense. You need gas fire places and such if for no other reason but power outages, as rare as they may be. less cars is always a good idea, but we are a car society and those bike lanes were just crazy, especially in some areas, where there were steep hills. the money spent on these bike lanes could have been better spent on other things bike lanes could have been put in lane ways, one street over from the main st, etc Oh, well some times we also need to be careful what we wish for, we don't know what is coming next. it could be worse. Good. That guy was an idiot and a trudeau bootlicker. Could you imagine trying to cook in a restaurant without gas lol? all those cruise ships,ferries container ships and coal transports to china must have acces to some clean burning magic fuel the rest of us can't find. What a hypocrite. Restaurants? The gas ban included restaurants? I didn't even think of that. You are absolutely right. I was a chef by trade originally and that's all that is used in the industry because it is clean and instantaneous heat.